1. Design and printing of participation certificates to encourage students who actively participate in science exhibition conducted in school level. 2. Printed assessment question papers to evaluate science knowledge of the students studying in Panjayat union and Govt. schools of Karur and Tirupur District. Quantity 6200 question papers. Our sincere thanks to our members and teachers to providing continuous support. 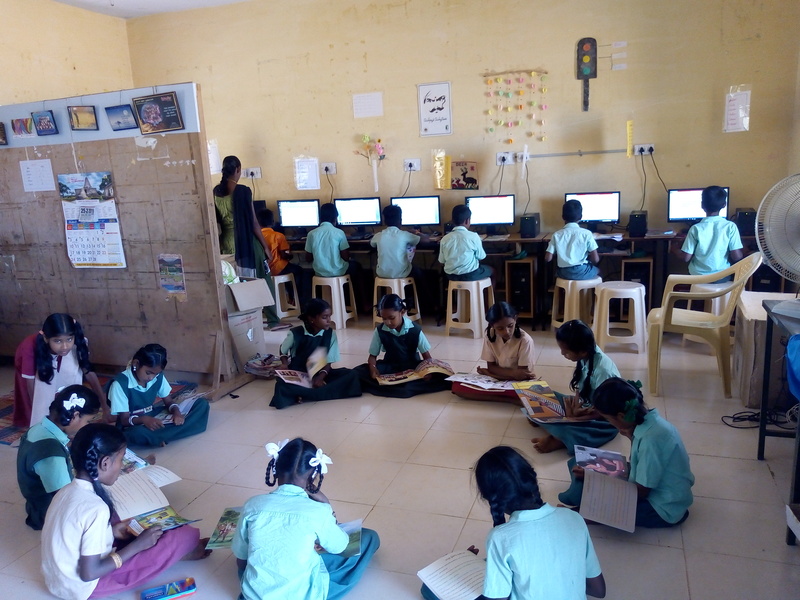 The purpose of the mail is to present the project report regarding the computers and stationeryprovided to India Sudar Computer Training Center-Melappedu. Students from Melappedu, Palavadu and Pakkam villages gets benefitted from this computer center. Indiasudar owns the computers and accessories. This center provides computer knowledge to the students and elders living nearby. Also provides a platform to increase the skill set of youth living in this village to empower them to get jobs. For your reference report details and photos are attached. Hearty thanks to our members for your great support to the next steps. Hope you’re all doing good. Here I’m presenting the report for Awareness Program conducted in Panchayat Union Middle School Kenganaickenpalayam. Program Moto : To create Environmental Awareness among students with songs, fun drama etc..
For your reference I’m attaching the Report details and photos taken during the session. Science Experimental Based Learning and Awareness(SEBLA) project is the brainchild of India Sudar. The objective of this project is to create interest and awareness among rural students in science through real time experiments. Indiasudar has trained teachers to demonstrate and explain the fundamentals of Science to students studying in 5th, 6th , 7th and 8th std of govt and panchayath union schools in cyclic manner. i.e. Each teacher is allocated certain number of schools and they visit one school per day. Their teaching can lead to better understanding of the subject and increase the interest on science among the students since we allow students to experiment (hands on experience) the low cost models. The experiments are very simple and easily understandable. The experiments are prepared by considering the academic curriculum. The successful implementation and outcome of this project are known by teachers and students of the schools wherever we have executed since 2010. Experiments are completed in time.Encouraged students to make their own experimental models for basics of science and started assessing. Students made many low cost models. We wish to mention that Our Teacher and teachers of PUMS Kenganaickenpalayam school motivated, guided and have done field work and submitted a project titled “ Eco System – Complications of Migrating Birds” to National Children’s Science Congress. This project got selected from District level and entered in to State level. Thanks to our members for your continuous support ! I have visited the Govt Middle school Kenganaickepalayam, Tirupur – Dt. From 1st to 8th Standards students are getting benefitted through this program. Weekly three classes are conducted for 6th to 8th students. Courses taken : Basics of Computer, Microsoft Excel, PowerPoint, Word, Paint. Remaining students during the computer class are engaged in reading INDIA SUDAR magazines. Library also available in the same room so students also having the opportunities to read the library books too. For your reference I have attached the Photos. Through SEBLA program students getting a great platform to learn about the fundamentals of science. Our science teacher Dinesh have done approximately 100 science experiments during his classes. I had an interaction with 8th standard students and discussed about the computer classes and science experiments. Students are showing keen interest to learn the science practically. With the help of Helping Minds a shutter has been built to divide two classrooms. If they need to conduct any joint program for all classes they are opening the shutter and making room for all students. Recently our IndiaSudar org conducted one Environmental awareness program. Very soon they are planning to conduct Annual Day and they invited us all. 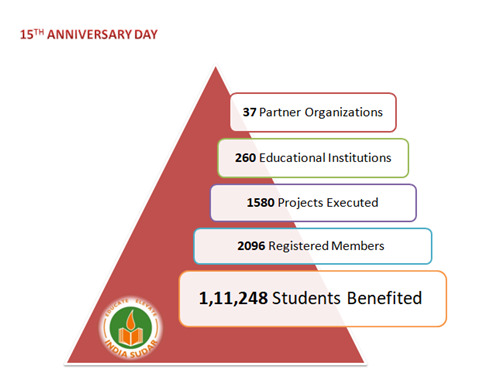 Today India Sudar Educational Trust celebrates fifteen years of selfless service to the society; we take this opportunity to thank our Members, Partners, Well-wishers, Teachers, Students and Volunteers for continuous support and volunteering to achieve our vision and mission. We look forward to your continued support in future. Your immense support and contribution could take one more step to the development of student’s education. Yes. in the line students of 1st std to 8th std from Municipal middle school, West colony, Kumarapalayam, Namakkal need Social and Science lab equipment such as maps,chemical agents and tools,biology specimens. It will be really helpful for them for better understanding of the science and social subjects with practical approach. So interesting and willing members give your valuable contribute and support as much and ping us.